Our window washing cleaners are experts in using purified water to clean windows. It’s chemical free, fast and leaves no marks, smears or residue, which means there’s nothing to re-attract dirt. Your windows will stay cleaner for longer. 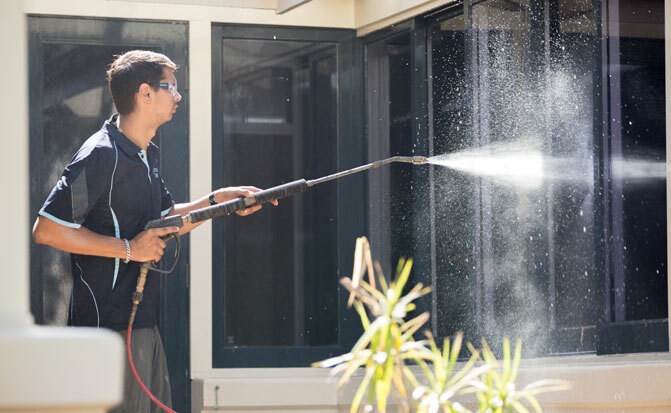 We offer an additional Vitroglaze cleaning and hydrophobic coating service for all our residential window washing services as well as commercial building window cleaning. Vitroglaze Australia is a product that will protect your windows from a build up of substances over time, so you won’t have to clean your windows as often and they’ll be easier to clean as the surface grime just comes away. For sparkling clean windows contact Pressure and Steam for a free quote. We service the Northern Beaches, Upper and Lower North Shore, Eastern suburbs and the Inner West. Air dry as there’s no need to squeegee the water droplets because purified water leaves a perfect, streak-free finish naturally! A spot clean (including buffing, spotting, (scraping – where there’s paint on the glass)) using traditional window cleaning methods is also done if required. Our team is professionally trained in our unique window cleaning process. The head technician working on each window cleaning job has completed vocational training in hard surface cleaning at ITI.